The little girl grasps her pencil, pink tongue escaping her lips as she practises the alphabet’s lazy loops and disciplined lines. When she closes her fuchsia notebook, Barbie’s symmetrical smile gazes up at her. The girl stashes her pencil in a pencil case printed with three dainty Disney Princesses before opening a My Little Pony storybook full of pastel horses with shiny, cascading manes and long eyelashes. These attractive faces that litter a little girl’s life on pillowcases, t-shirts and reading material aren’t bad or wrong. But surrounding our daughters with images of females whose main feature is prettiness just might ingrain the message that appearance is paramount. 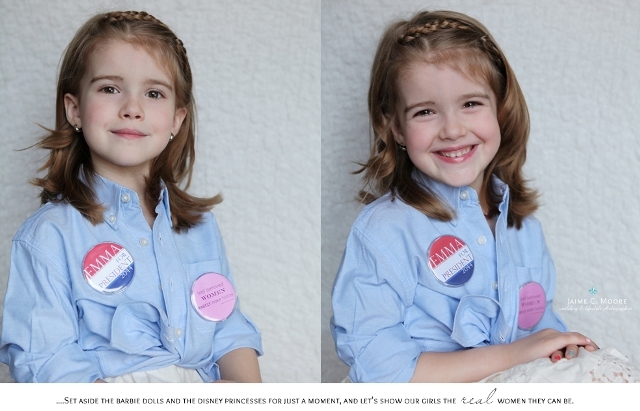 In the photo essay, Emma dresses up like Susan B. Anthony, Coco Chanel, Amelia Earhart, Helen Keller and Jane Goodall. What results is not only a surprising depiction of a five-year-old’s strength and charm, but a moving tribute to her limitless potential. It’s kind of wonderful to see Emma embodying her possible future selves – a social activist, a fashion designer, a pilot, a lecturer who overcomes impossible odds, and a campaigner for animal welfare. Or even president of the United States. Lip caught up with Moore for a chat about the photo project. You’ve been re-blogged all over the world – it’s obvious that the photos have a certain power. Do you think that there is still a level of inequality between men and women in Western culture? We have come a long way but even in 2013 (in the USA) a woman can still make less an hour than a man for the same job. That is not equality. I have absolutely loved receiving hundreds of beautiful messages from women and men from all over the world. Some people would describe your photo essay with Emma as a feminist act. Do you agree? I wasn’t raised a “feminist”… it was a word I never heard mentioned growing up. Instead I had a very strong mother and grandmother who lived their lives equal to men – there was never a question whether or not something couldn’t be done or allowed because they were women. They lived the life they wanted for themselves regardless of not being a man. The definition of a feminist is ‘a person who advocates equal rights for women’; there shouldn’t be a label for a woman wanting the same rights as a man. A big thing for me (in choosing these five women) was that these incredible women overcame such obstacles and persevered to change their lives simply because they wanted to … Amelia wanted to fly a plane, so she did. Not letting society’s “rules” direct their lives for them, they raised the bar and we should continue to. How important are role models to girls growing up? Oh I think it is very important for people in general but especially for children and young adults. You are still learning who you are and who you can become. Emma is a very creative and independent girl herself. I had mentioned several times about needing to photograph her five year portraits and when I proposed the idea of doing something completely new, she was so excited. We had so much fun picking out the costume pieces and through each woman’s portrait I would tell her about each incredible woman. Learning of Amelia Earhart seemed to be her favourite (although Jane Goodall was a close second). Just the idea of her dressing like the first female pilot to fly across the Atlantic and Pacific Ocean thrilled her. I love her facial expression in the photograph. I took the shot as I cheered, ‘Emma you just flew a plane, by yourself, over the Ocean!’, and in her eyes I see so much pride and confidence. I love seeing that come through [in] an image and it means so much more seeing it in my daughter’s eyes. You can view Jaime Moore’s photography on her Facebook page and website. This entry was posted in Featured and tagged arts, mother, women. Bookmark the permalink.